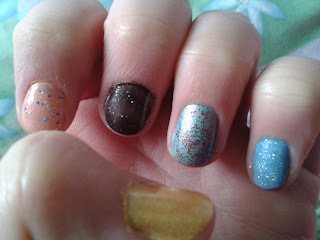 Back in July i bought a 3 pack of mini Models Own glitter nail polish in green red and blue. I havent used them yet, but im really looking forward to using them at Christmas. The only thing i dislike about glitter polish, is that its so hard to remove! Has anyone else been doing glitter nails? Has anyone got any tips on removing glitter nail polish?